Today my husband and I made the 2 hour trip up to the Lincoln, NH area. 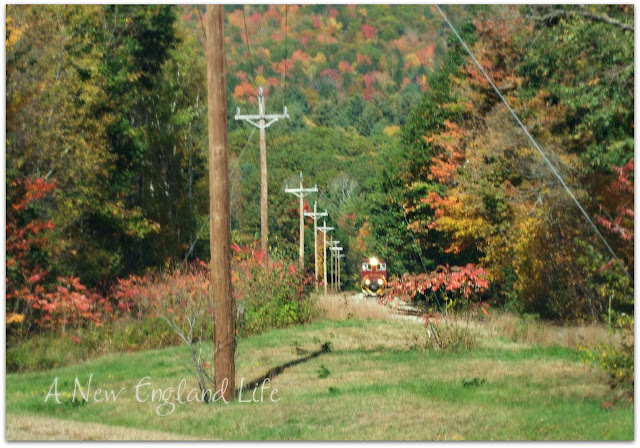 On the way we took a side road through Woodstock, NH. It was a fluke thing, asking my husband to turn around so we could 'take that little road back there'. I'm SO glad we did! That little road turned out to be route 175 which runs along side Route 93. It's a nice scenic drive. I'm always a big fan of the road less traveled. Wouldn't it have been perfect if the train were on the tressel? Now THAT would have been a picture! Sorry, I couldn't wait that long. Actually I thought I saw the light through the trees as we were coming down the road. As hard as I tried, I literally had a second to get the shot. My camera wasn't on the right setting so it ended up a bit blurry since the car was moving. Oh well. Maybe next time. Directly across the street from the river sat a home decorated for fall. I'll bet the lights on the fence are pretty at night. Living across the street from such a beautiful river must be nice, but it's so remote that I just couldn't handle it. I hope to share more photos from our trip very soon. 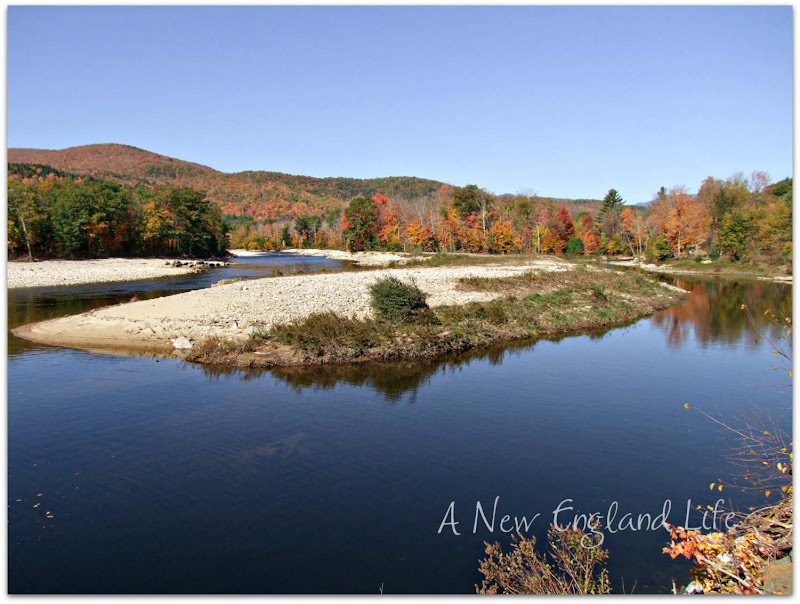 fabulous classic New England shots, thanks, I feel like I just took the trip! Beautiful. We did that ride once. I think we will do it again when I visit next year. Love the autumn photos! We aren't in Indian summer here in Phoenix; still summer (Ugh). How I wish I could see some of that color. Just what I needed this morning!!!! These are gorgeous! I will definitely be coming back here today to look at these again and again! SO glad you took that side road. Gorgeous, gorgeous, gorgeous. Thank you for this slice of my former New England life. Gorgeous photos! The top photo reminds me of our trip on a vintage parlor train to the Yukon! Your photos are sensational. Makes me want to take a trip right now! Gosh, these are so gorgeous! 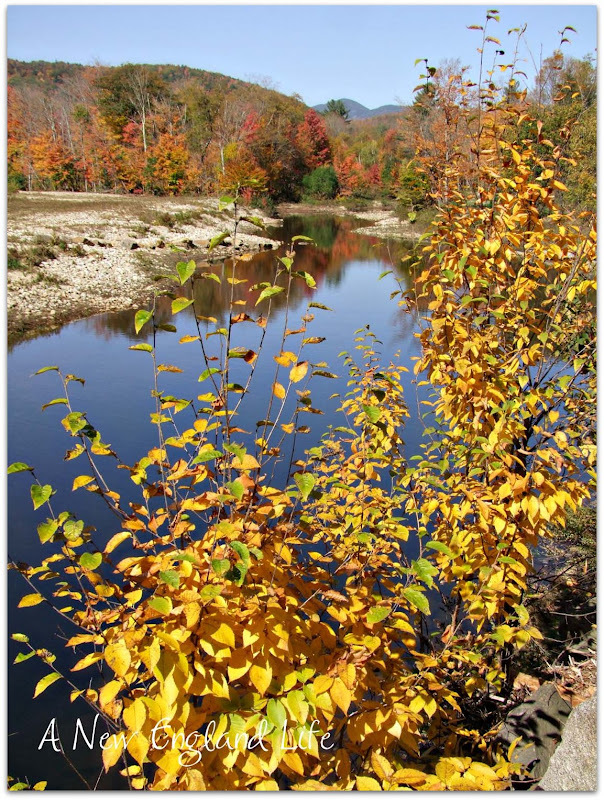 The fall foliage is wonderful! 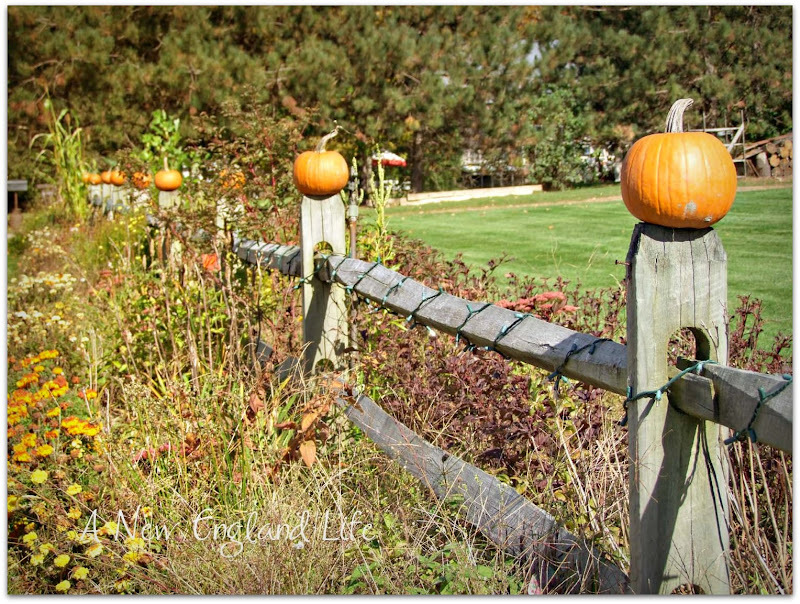 I love seeing the train coming from a distance, and those pumpkins sitting on the fence posts are adorable! So beautiful! 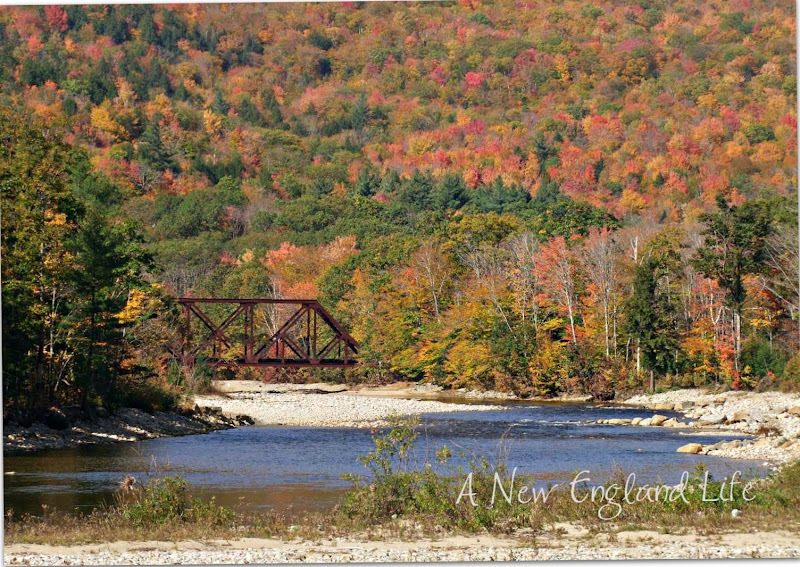 I love fall in New England, there's nothing like it! Beautiful. The color here is not close to peak yet, so I'm patiently waiting. Gloriously beautiful pictures, Sharon! Maybe you can photoshop in that train - LOL! Wow, beautiful color! So glad you took the road less traveled. I can't wait for peak color to reach us here in Boston! Thank you, Sharon......so interesting this time of year. One can never get too much of fall foliage. Our foliage here in the Finger Lakes of NY is not peak yet. We are going to get alot of rain this weekend. We will see after that. I love to come to your blog! PS...we always take the "back roads"! Gorgeous photos! That train looks like it is going to run you down! Ah...I fear my annual trip to New England in October...at least for the past 3 years since I moved from New England back home to Jersey...will not happen this year. Luckily for me, you've captured it's essence and shared. love fall pictures. Gorgeous shots of the trees! I am so glad you took the road less traveled - that way you could stop to take all these beautiful photos and share them with us!! I miss my home state so much. It's beautiful down here on the gulf coast...but NOTHING is like New Hampshire. I want to be up there so bad I can't stand it. I was there this time last year. The most beautiful place in the USA in my opinion! Thanks so much for the gorgeous pics that make me feel like I am right there now! Oh my gosh, such beautiful scenery. What a great drive for taking photos. Such beautiful pictures and lovely part of the country you live in. I always love seeing what you have to share with us. 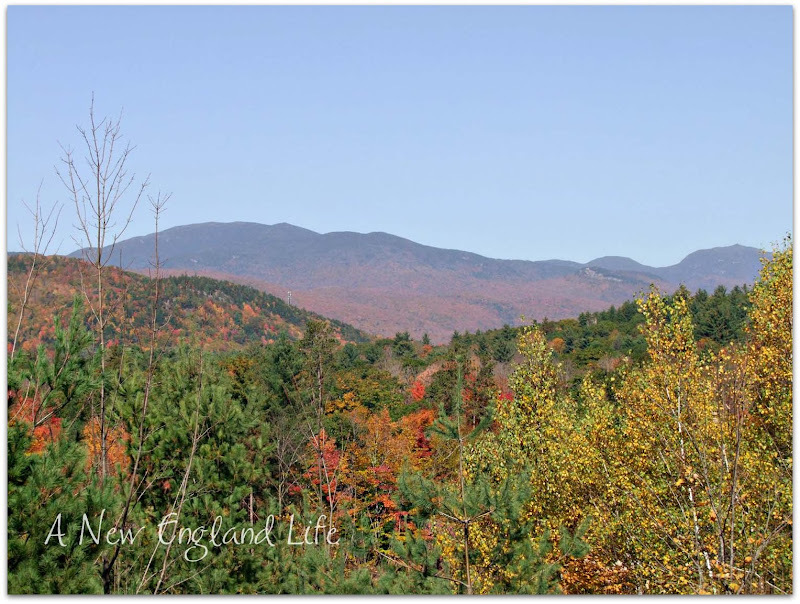 Sigh - picture-perfect New England fall! I like scenery blogs and yours looks like a good one! You needn't apologize for the train photo....I think it is excellent! 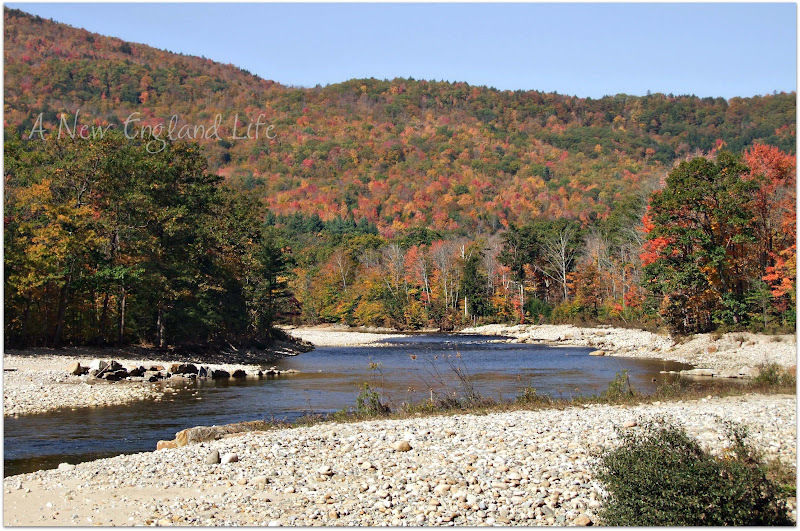 We just got back from a trip to Connecticut and Rhode Island and truly enjoyed the Fall scenery! Look forward to living there someday...! Ooooo, love that shot of the bridge and the fence one too! Gorgeous!